The town is part of the Adirondack Park, and includes 15 of the 46 High Peaks, including Mount Marcy, New York's highest mountain, and the rest of the Great Range. It also includes the Ausable Lakes, the source of the Ausable River. Trailheads for many of the High Peaks are located within the town, along with the Johns Brook Lodge of the Adirondack Mountain Club. The area had been a stronghold with the lumber and iron industries. However, exporting items made by these industries was difficult due to lack of transportation. By around 1820 sawmills, forges and gristmills were being built. The riverbed region of Keene sprouted the first community, and Keene Flats become another by 1840. In 1882, when the Adirondack Park was created as a state protected area, a privately tolled and maintained road to lower Ausable Lake was constructed. In 2011, the town completed a grassroots project to bring broadband service to more than 97% of the homes in Keene, and installing the service in every home with a student in the town's public school. The extension of this network into rural areas makes it unique in the Adirondack Park. The Hurricane Mountain Fire Observation Station and Walton Bridge are listed on the National Register of Historic Places. According to the United States Census Bureau, the town has a total area of 156.6 square miles (405.6 km2), of which 155.9 square miles (403.9 km2) is land and 0.69 square miles (1.8 km2), or 0.43%, is water. Many of the High Peaks of the Adirondack Park are in or near the town, including Mount Marcy, elevation 5,343 feet (1,629 m), the highest point in New York. The Garden, one of the most popular trailheads in the Adirondacks, is located in the hamlet of Keene Valley and is the eastern end of the Johns Brook Trail, leading to Johns Brook Lodge, Mount Marcy, and the heart of the High Peaks Region. The Lower Ausable Lake and the northern half of the Upper Ausable Lake are in the town of Keene. The East Branch of the Ausable River flows north out of the Lower Ausable Lake and passes through the hamlets of St. Huberts, Keene Valley and Keene before entering the Town of Jay. The Hull's Falls cascade near Keene is a local scenic site. New York State Route 9N changes from north-south to east-west south of Keene hamlet, at the foot of Spruce Hill. New York State Route 73 changes from east-west to north-south just north of the hamlet of Keene. As of the census of 2000, there were 1,063 people, 443 households, and 279 families residing in the town. The population density was 6.8 people per square mile (2.6/km2). There were 984 housing units at an average density of 6.3 per square mile (2.4/km2). The racial makeup of the town was 98.68% White, 0.09% African American, 0.19% Native American, 0.47% Asian, 0.09% from other races, and 0.47% from two or more races. Hispanic or Latino of any race were 0.38% of the population. There were 443 households out of which 29.6% had children under the age of 18 living with them, 53.0% were married couples living together, 6.3% had a female householder with no husband present, and 37.0% were non-families. 31.4% of all households were made up of individuals and 13.5% had someone living alone who was 65 years of age or older. The average household size was 2.30 and the average family size was 2.90. In the town, the population was spread out with 21.8% under the age of 18, 5.9% from 18 to 24, 22.3% from 25 to 44, 30.4% from 45 to 64, and 19.6% who were 65 years of age or older. The median age was 45 years. For every 100 females, there were 85.8 males. For every 100 females age 18 and over, there were 85.1 males. The median income for a household in the town was $34,226, and the median income for a family was $44,250. Males had a median income of $35,417 versus $22,083 for females. The per capita income for the town was $17,037. About 1.4% of families and 4.7% of the population were below the poverty line, including none of those under age 18 and 5.1% of those age 65 or over. Ausable Club - late Victorian Queen Anne stick-style hotel, added to the National Register of Historic Places in 2005. Cascade — A former community in the western part of Keene. Glenmore — A former hamlet east of Keene hamlet, located on County Road 13. Keene (formerly "Keene Center") — A hamlet in the north-central part of the town on Routes NY-73 and NY-9N. Keene Valley (formerly "Keene Flats") — A hamlet south of Keene hamlet on NY-73. The Beer's Bridge, Keene Valley Library, Notman Bridge, Ranney Bridge, and Slater Bridge are listed on the National Register of Historic Places. St. Huberts — A hamlet in the south part of the town on NY-73. Putnam Camp was added to the National Register of Historic Places in 2012. Lower Ausable Lake — A lake in the southwest part of Keene. Upper Ausable Lake — A lake partly in the town at the south town line. The Great Range — A 10-mile-long (16 km) mountain range that includes 7 of the 46 Adirondack High Peaks. Mount Marcy — The highest peak in the state is in the western part of the town, southwest of Keene Valley and St. Huberts. ^ a b "Geographic Identifiers: 2010 Demographic Profile Data (G001): Keene town, Essex County, New York". U.S. Census Bureau, American Factfinder. Retrieved March 3, 2016. ^ a b Donaldson, Alfred L. (1921). A history of the Adirondacks. New York: The Century Co. Retrieved 2013-12-14. ^ "Keene, NY". Essex County Historical Society. 2008. Retrieved 2008-08-27. ^ H.P. Smith (1885). The History of Essex County. D. Mason and Company. ^ "Keene paves way for broadband", North Country Public Radio, January 14, 2011. Retrieved September 27, 2013. ^ "Overview of the Town of Keene, Essex County, New York". April 17, 2015. Archived from the original on May 13, 2017. 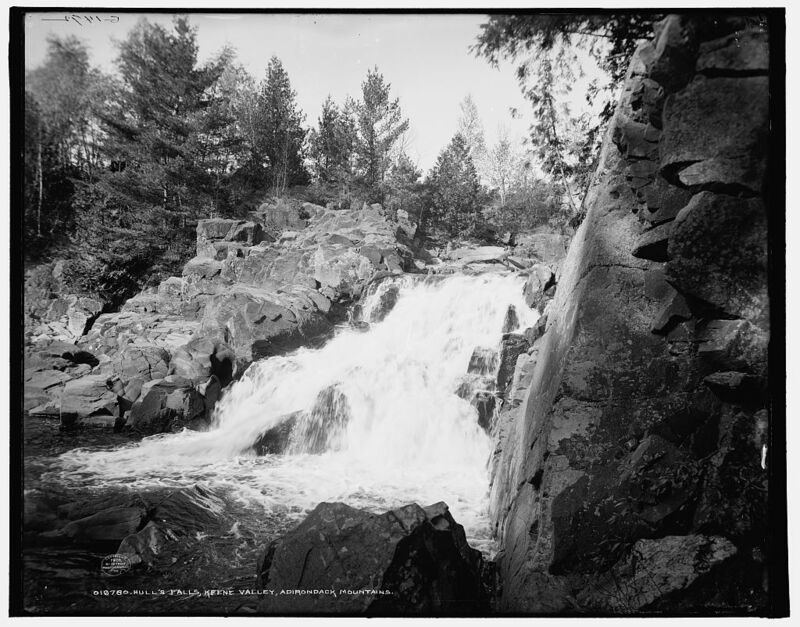 ^ "Hull's Falls, Keene Valley, Adirondack Mountains" (photograph). Library of Congress from Detroit Publishing Company. 1903. Archived from the original on 11 December 2015. ^ "National Register of Historic Places Registration: Ausable Club / St. Hubert's Inn; Beede House; Beede Heights Hotel (Project number 04PR06792; Historic Register number 04NR05398)". May 11, 2005. Archived from the original on 7 May 2017. ^ "National Register of Historic Places". Weekly List of Actions Taken on Properties: 10/15/12 through 10/19/12. National Park Service. 2012-10-26. This article incorporates text from a publication now in the public domain: Donaldson, Alfred L. (1921). A history of the Adirondacks. New York: The Century Co. Retrieved 2013-12-14. This page was last edited on 12 August 2018, at 16:56 (UTC).